Peter Zielonka is currently in the fifth semester of his B.A. International Management course in Dortmund and is very interested in the consumer goods industry. He therefore chose to undertake a work placement in this specific area of business. The 23-year-old student spent four months gaining invaluable insights into professional practice at Pepsi Lipton International in Geneva. Peter was a member of the global human resources team. Besides day-to-day business, his tasks included developing a newsletter and a social media project. "Unilever and PepsiCo are represented on LinkedIn, but this does not apply to many of the individual divisions. I therefore developed this for Pepsi International and Unilever for German-speaking Europe," explains Peter. "I really enjoyed this role, as I was able to travel to Hamburg and work with the Unilever team. Furthermore, I also had the opportunity to make some interesting contacts." The entire work placement had a very international focus. "Staff at the headquarters came from ten different countries, which meant I had to speak French, English and Spanish. Contact with people from various regions throughout the work placement ensured it was a very global work culture." And he felt very much at home in this atmosphere. "I was fully integrated in the team and was encouraged to work independently." 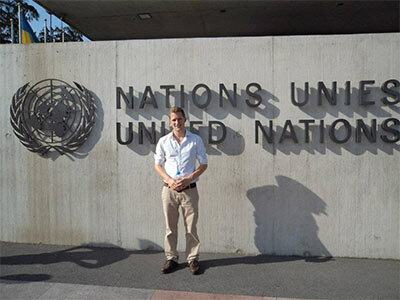 Peter made such a good impression at Pepsi Lipton International in Geneva that he has been offered a further work placement at the company's offices in London. "I obviously accepted the offer and will start in London in January 2013."